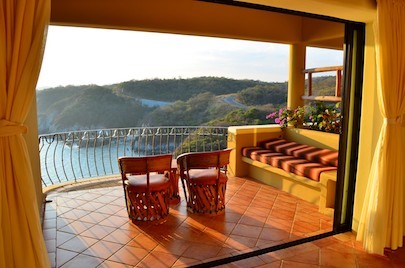 Huatulco’s Las Palmas Resort – 24 Hours in Heaven! 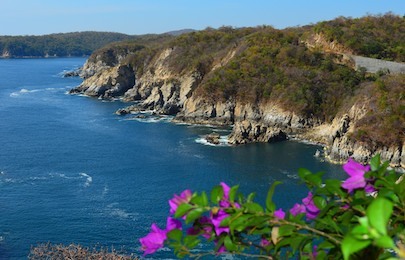 Mid-December, 2012 – Life aboard our sailboat Groovy, anchored in Bahía de Santa Cruz in Huatulco, had become deliciously languid and slow, with one day flowing seamlessly into the next. 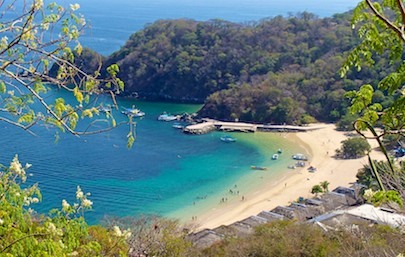 Huatulco was gradually filling with tourists, and every day we saw more and more people going out on the tour boats and sunning themselves on the beaches. Sitting on Groovy, we had front row seats to whatever action cropped up in the bay, and it was pleasant entertainment just watching whatever was going on around us. 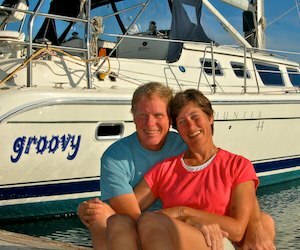 Many of the tour boats would take a little detour on their way in or out of the bay to circle Groovy and give us an enthusiastic wave and a chorus of greetings from happy guests. One morning two couples in kayaks and a paddle board floated over to our boat. We exchanged hellos and “where are you from” queries and “what a beautiful day this is!” comments. We discovered that they were from Lake Tahoe and were boating enthusiasts too. Wow! Most folks we meet say they are staying at a resort. This was the first time we met someone who owned one. And he looked so relaxed and happy sitting there in his kayak. Gosh…and I had thought that we were living the dream!! “Come on up sometime! 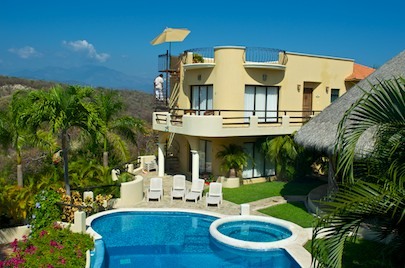 You can see the resort and have a beer with us.” My jaw dropped as he continued on, explaining how to walk to the resort. “It overlooks Playa Violin,” he said. Then his little group paddled away and Mark and I turned to look at each other, wide eyed, and grinning. That just wouldn’t have happened in our old workaday life in our old neighborhood. Never! What a fun encounter. What a neat opportunity! 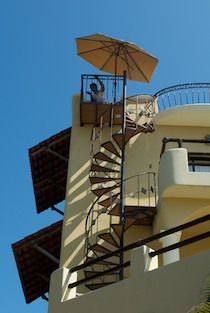 Over breakfast the next morning we debated: Go to the beach, do errands in town, or check out that resort? That was a short debate! We quickly dinghied ashore and began hoofing it up and over the hills to try to find Las Palmas. It’s easy to find, but we got lost anyway and went well beyond it. On our way back we looked across the little beach of Playa Violin, and there it was, an ethereal group of buildings and terraces perched on the edge of the cliffs. “That must be it,” Mark said, picking up the pace down the hill. Then we glanced up and saw a pickup truck coming towards us with Ron driving and his friend, Craig, who had been the one on the paddle board, in the passenger’s seat. 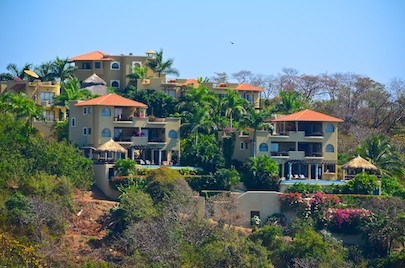 They picked us up, and suddenly we were passing through the tall entrance gates of Las Palmas Resort, driving into a gorgeous luxury property. Ron’s wife Jackie and Craig’s wife Terri were there welcoming us, but everything was a blur around us. 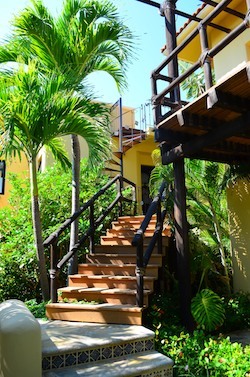 All we could see was the lovingly nurtured landscaping, lush with flowers and tropical plants, that hugged the myriad of balconies and lookouts and infinity pools all around us. 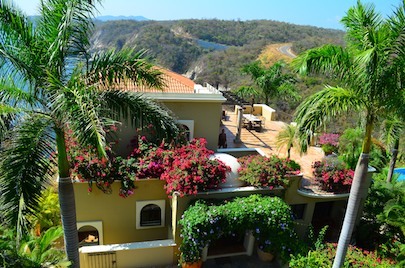 The property was built high on a hill, and the buildings and palm trees soared even higher, offering stunning views of the beach, little Violin bay, the open Pacific ocean, and the bay of Santa Cruz, depending on where you stood and which way you turned your head. 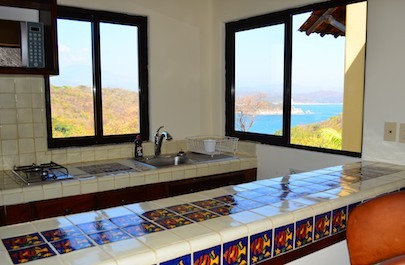 Some suites have kitchens too! We have seen a lot of resorts in this cruising lifestyle. 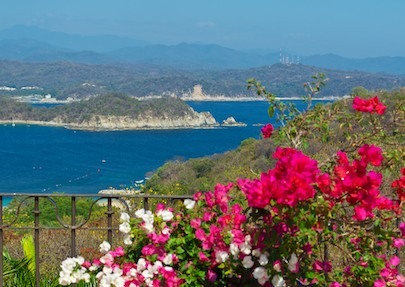 In many ways, cruising Mexico’s Pacific Coast can be an ongoing tour of oceanside resorts, as most anchorages are located in spots that lend themselves to resort development. And quite often we’ve had a chance to wander through to see how the other half lives. But this resort was head and shoulders beyond anything we’ve seen. It was intimate, each room was unique, and everything about it quietly blended into the surroundings, giving guests a true retreat while pampering them with the finest of everything. 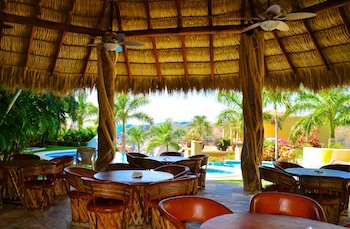 A little restaurant/bar under a thatched palapa roof seemed the ideal spot for all the guests to gather and mingle. However, we were lucky enough to have met these new friends before peak season hit. For the moment, we had the place to ourselves. “A lot of people come here for a few weeks,” Ron was telling us. “They get to know each other, and now there’s a community of people who come back year after year.” What a way to spend the coldest part of winter! 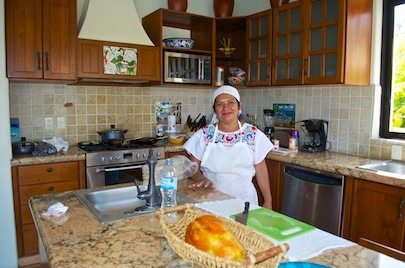 Gourmet meals are prepared in a beautifully appointed kitchen, and the colorful parrot Lucy greets everyone. Building this resort was an act of enormous faith, propelled by Ron’s brilliant vision of bringing charm and luxury to paradise. Running several tourist businesses in Lake Tahoe, he had never developed a luxury resort before. What an accomplishment! 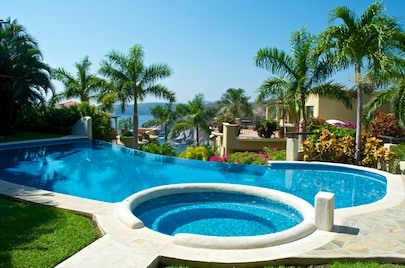 There are lots of laws, rules, regs and hurdles to leap to create a property like this on the Mexican coast. 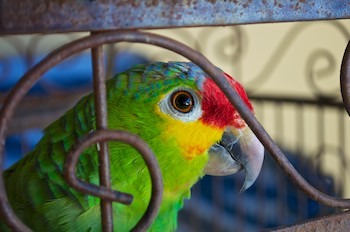 Too many resorts in Mexico remain unfinished, with rebar, bare concrete and gaping holes staring forlornly out to sea from exquisite perches on land. To complete a project of this scale is an incredible achievement. And right down to the unusual decorative tiles and lovely fittings adorning each room, every possible detail has been thought of and completed to perfection. 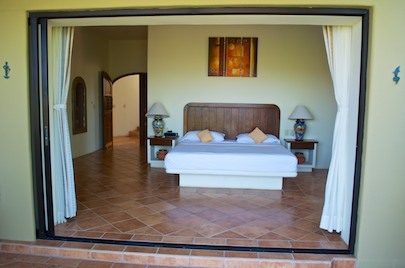 What I loved most, though, was that all the windows and doors in all the rooms can be thrown open to bring in the ocean breezes along with the view. Every room Ron showed us was unique in the way it took advantage of its particular position on the hill, and all the rooms eagerly welcomed the outdoors in. 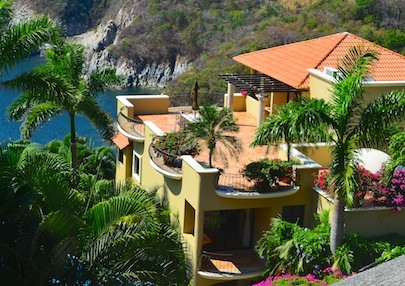 We quickly lost track of how many rooms there were, and how many buildings made up the property, and where all the infinity pools were located. But there was a main house that was often rented for big family gatherings, weddings, or corporate retreats, and standing in that space made us feel like we’d stepped into the lives of the rich and famous. Suddenly, Ron asked if we’d like to spend the night. “I know how it can be on a boat. Sometimes it’s really nice to get off the boat for a night and get a long hot shower.” Holy cow. Getting off the boat to a stationary bed would be nice. 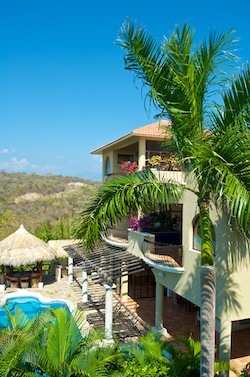 But staying here at Las Palmas would top anything we’d imagined by a long shot! He showed us the room where we’d be staying. 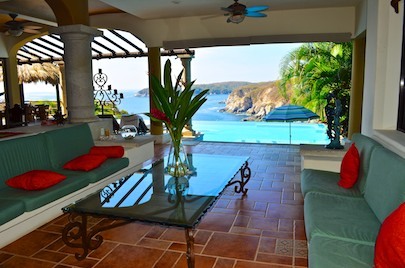 It was in an incredible spot with the doors thrown wide to a spectacular view of the beach and cliffs. You can enjoy the view even in the shower! Rather than a mere window onto the view, the opening to the deck was almost the full width of the room, bringing the outdoors rushing in, and flooding the room with the bay’s soft light of late afternoon. 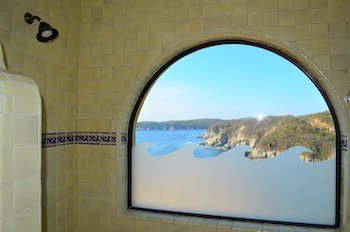 Even the shower had a view. 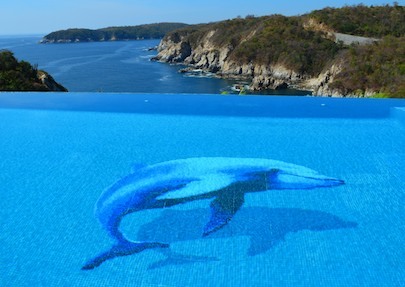 One pool has an image of a dolphin on the bottom! Somehow, effortlessly, the logistics for our stay sorted themselves out. 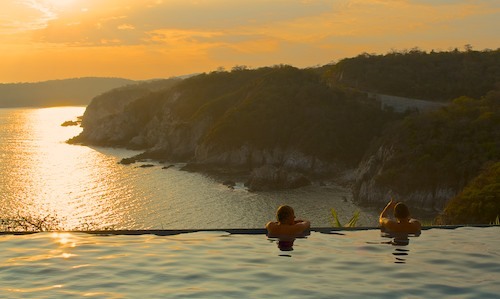 We dashed back to Groovy for an overnight bag, and then found ourselves enjoying the golden hour in the big house’s picturesque infinity pool as the sun slipped behind the cliffs. Terri put a delicious Margarita in my hand, and I watched Mark swim over to the edge of the pool to soak in the view with Craig. “I feel like I died and went to heaven,” I said happily as I slid into the silky warm water to join them. How, exactly, had we been granted 24 hours in heaven? Who knows! It was the best and most vivid dream, yet we were wide awake in the midst of it. More margaritas on the deck overlooking the pool, dinner out at Huatulco’s finest restaurant, a pink sunrise reflecting off the water, and an amazing American/Oaxacan brunch poolside once again in the morning, all made us feel like Santa had come early and invited us to spend a day in someone else’s life. And then, what a joy it was to be able to take our new friends out sailing a few days later. 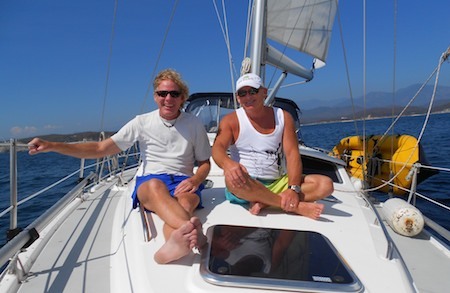 The gods of the wind and the sea cooperated beautifully and gave us ideal conditions for a daysail. 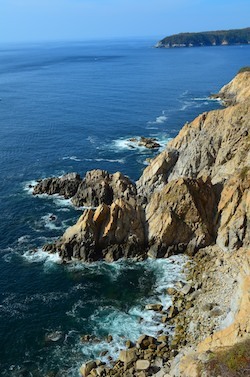 Modest breezes, flat seas, and bright sunny skies followed us along the coast. As we chatted, the boat took flight in the light wind, and we discovered that “boating enthusiast” was an understatement in Ron’s case. He had crewed on the TransPac ocean sailing race from California to Hawaii as a youngster, and had become a licensed Coast Guard captain to boot. As if welcoming the sailor back to the sea, Groovy came alive and took us all on a speedy, carefree ride, and the world fell away in our wake. 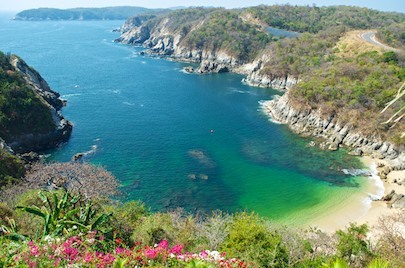 We continued to stay in the Bays of Huatulco and enjoy its delights, including a visit to its wild side at Playa La Bocana.